An impressive & flexible large 3609 sq. 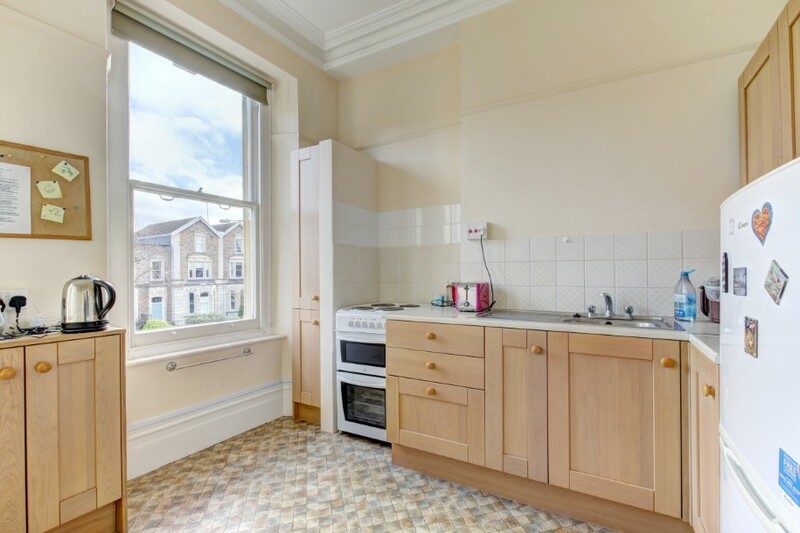 ft. mid Victorian period semi-detached town house with 12 main rooms over 4 floors. 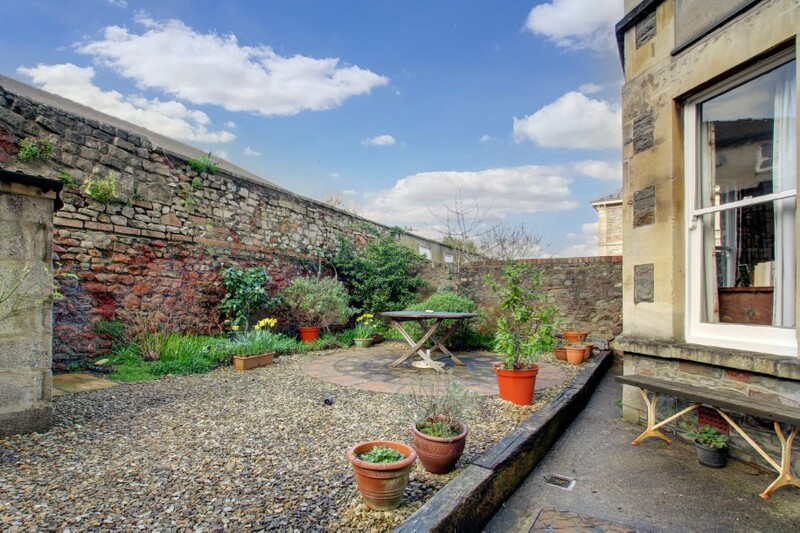 Has front & rear town gardens including off street parking for 2/3 cars in a prime location near Clifton College & the Downs. Currently arranged with 3 self contained homes in one providing an exceptional up market 'home plus income' platform. Easily reverts to a stunning single family residence or has potential for further flat conversion subject to any necessary consents. 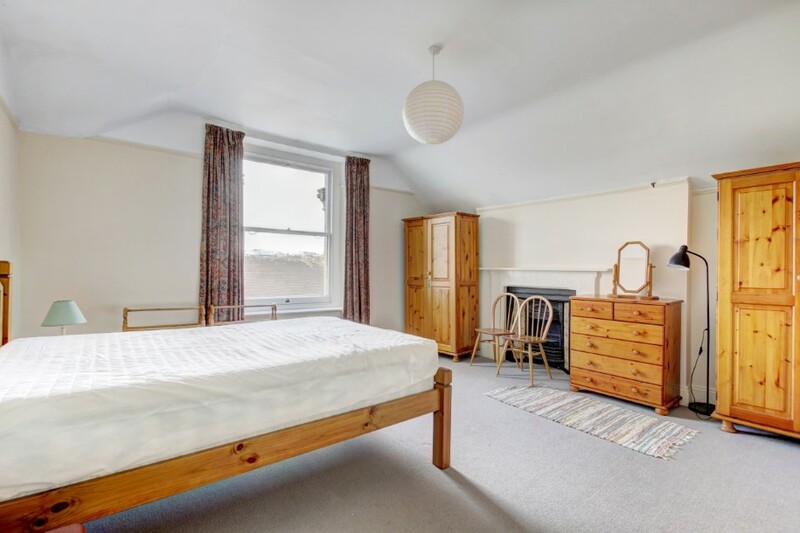 Two large 1 bedroom flats each with sitting room, Kitchen/breakfast room and bathroom/wc occupy the first & second floors. 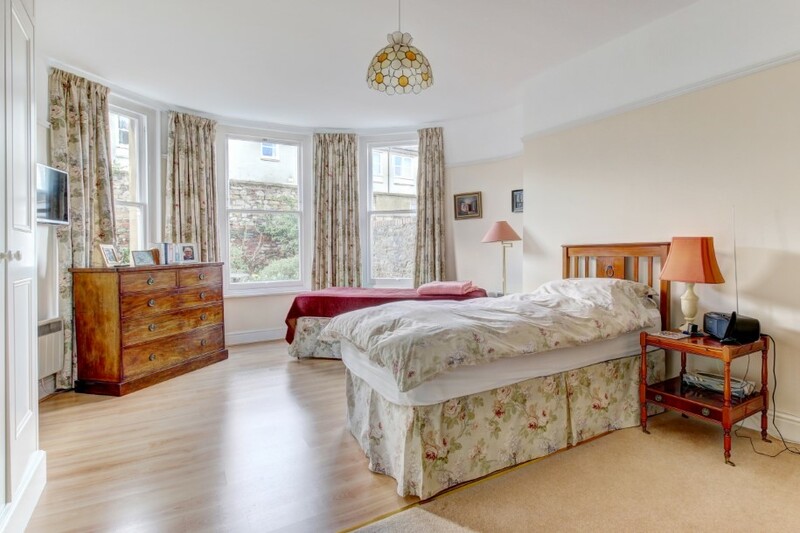 The accommodation has a very civilised & homely atmosphere with natural light flooding in through big sash windows. Retains many original period features including ceiling cornices & roses, numerous fireplaces & some stained glass fenestration. 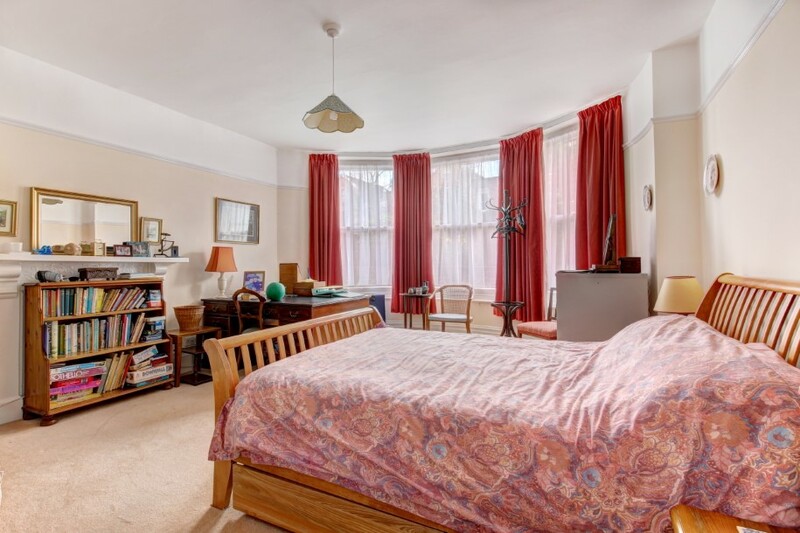 A grand but understated & well appointed house with immense character & generously sized principal rooms. A grand but understated and well-appointed house with immense character, generously sized principal rooms, a very civilised & homely atmosphere and many original period features including ceiling cornices, stained glass windows, numerous fireplaces and big sash windows which flood the house with natural light. 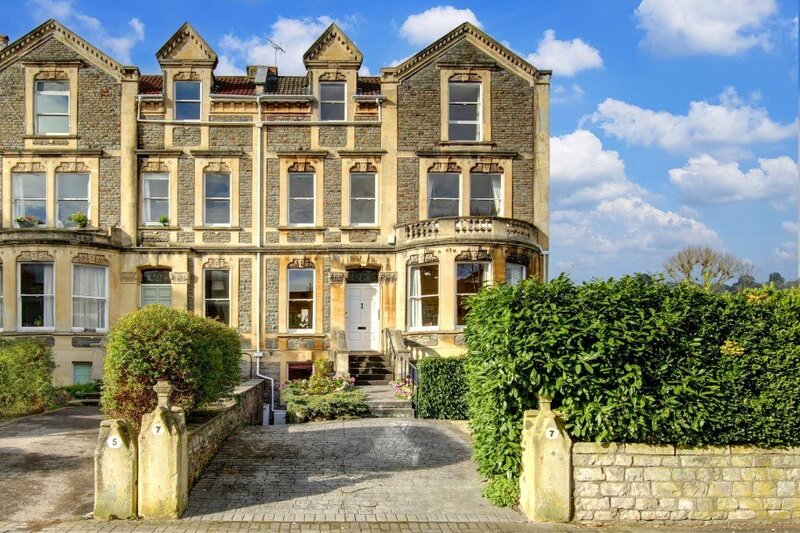 In a prime location near Clifton College and so convenient for Whiteladies Road, Clifton Village and the Downs, with easy access to the city centre, business, shopping and commercial districts, the waterfront area, Bristol University and Park Street environs, main hospitals and a good selection of state and independent schools including Bristol Grammar and Clifton High. 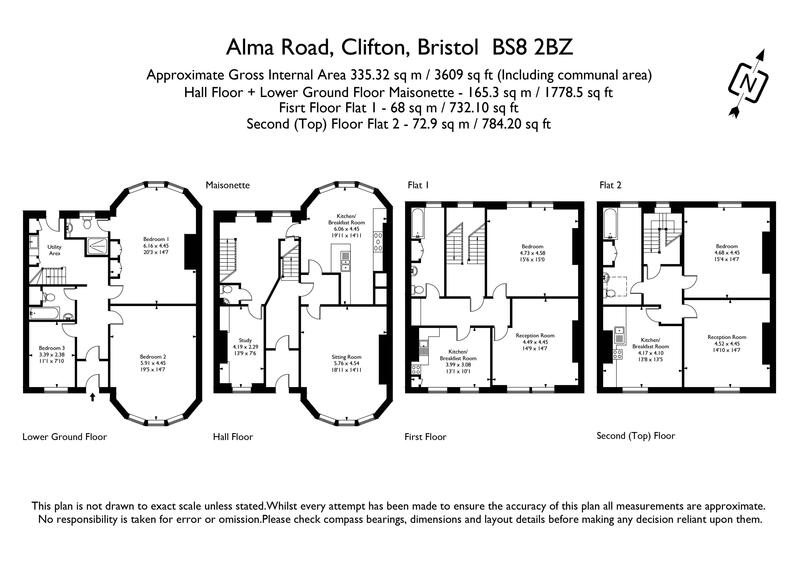 Hall Floor - Maisonette: communal porch entrance and inner hallway, entrance hallway, sitting room, kitchen/dining room, inner hallway/landing, study. Lower Ground Floor - Maisonette: enclosed porch entrance, inner hallway, bedroom 1 with en-suite shower room/wc, bedroom 2, bedroom 3, bathroom/wc with shower, utility & rear hallway area. First Floor - Flat 1: entrance hallway, sitting room, kitchen/breakfast room, bedroom, bathroom/wc with shower. Second (Top) Floor - Flat 2: entrance hallway, sitting room, kitchen/breakfast room, bedroom, bathroom/wc with shower. 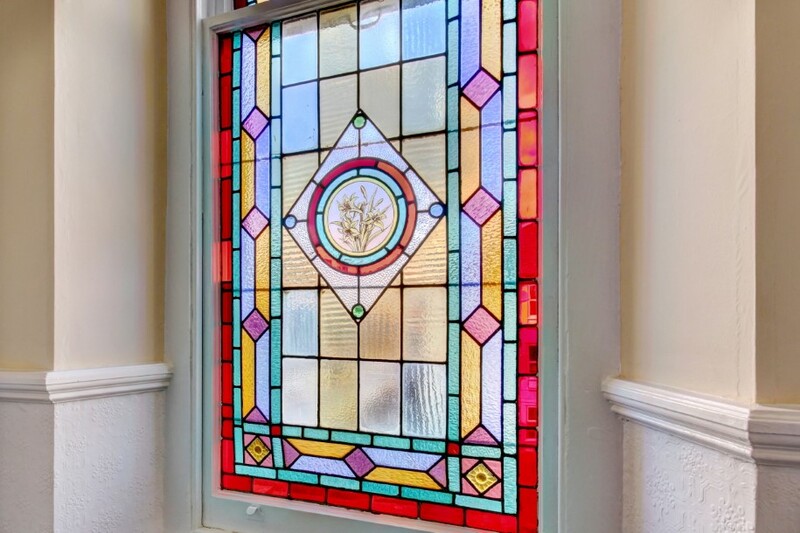 via paved front courtyard/parking area within front garden area, steps and railings with stone balustrade lead to the main front entrance door with stained glass fanlight, secondary front entrance door at lower ground floor level in under the front of the house via a side path. 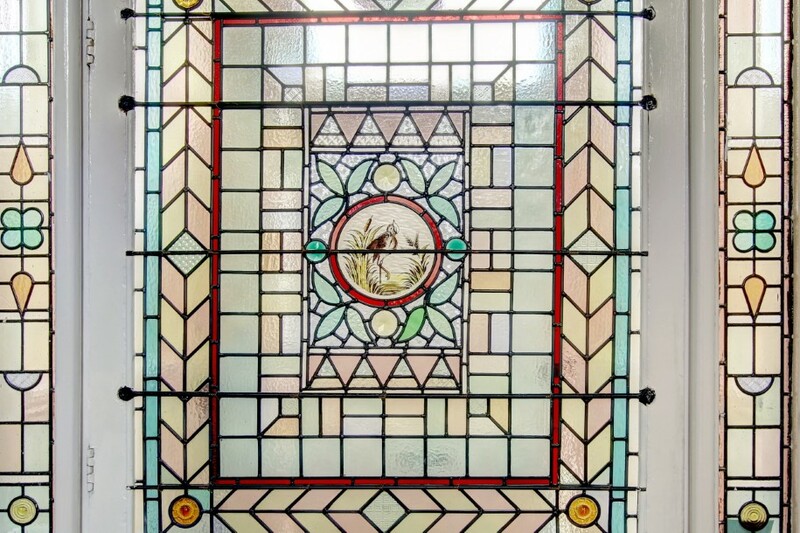 ornate ceiling cornice, fine tessellated floor, dado rail, inner door and side/over lights with beautiful stained glass, communal Inner Hallway with ornate ceiling cornice, dado rail, original door bell, staircase rising to upper floors, door off to maisonette. 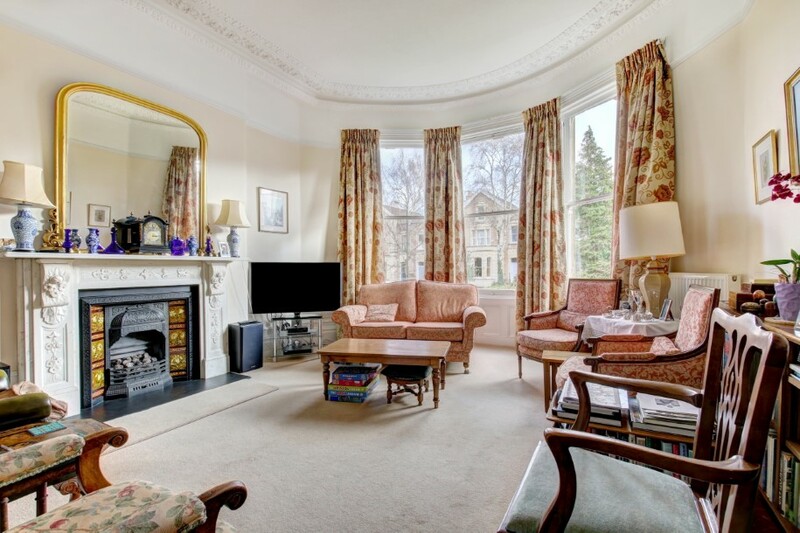 ornate ceiling cornice & centre rose, picture rail, wide bay with triple sash windows, period fireplace with marble surround/overmantel & iron/tiled insert & fire basket with inset living flame coal effect gas fire, radiators. ornate ceiling cornice & centre rose, picture rail, wide bay with triple sash windows, twin vertical radiators, laminate strip flooring with oak finish, comprehensive range of good quality kitchen base and wall units incorporating drawers, cupboards and cabinets together with butchers block worksurfaces with tiling behind & lighting over plus 1 1/2 bowl stainless steel sink unit with mixer tap and rinsing bowl, 5 ring gas hob unit, twin electric ovens/grill, upright fridge/freezer, shelf for microwave. 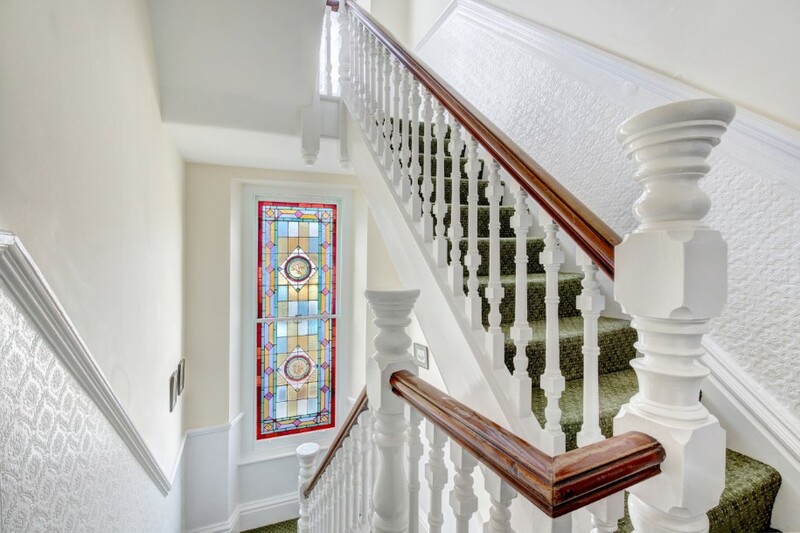 sash window with adjacent picture window, cupboard understairs, staircase down to lower ground floor. 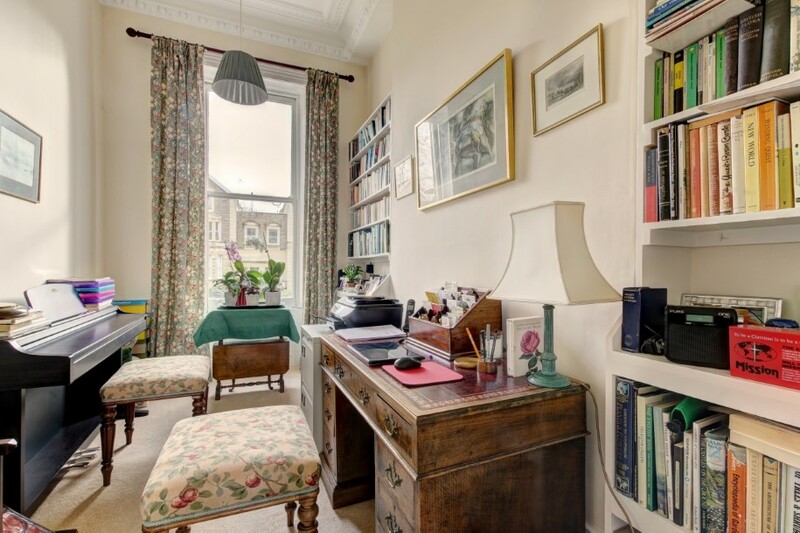 ornate ceiling cornice, sash window set into shallow bay, bookshelves built into both chimney recesses, radiator. 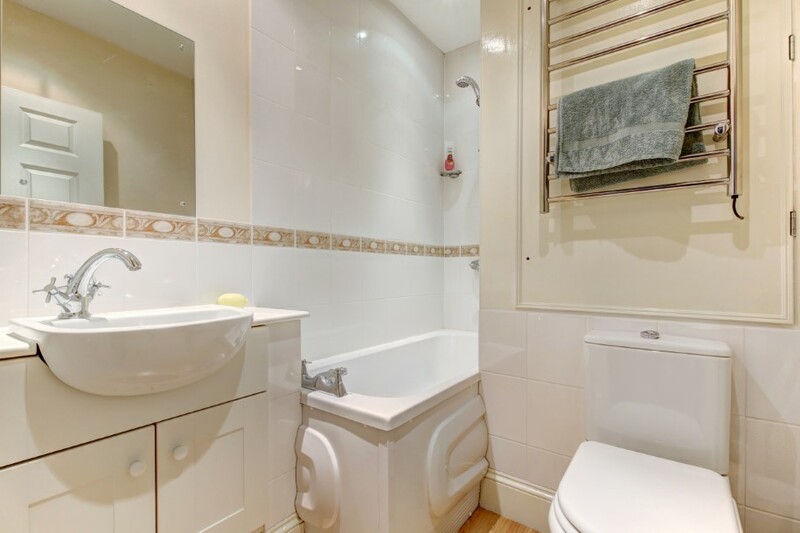 white suite in tiled surrounds, low level wc, hand basin, radiator, extractor fan. internally via staircase down from the hall floor, externally via secondary front door into porch and front hallway. radiator, opening through to rear hallway and utility room. 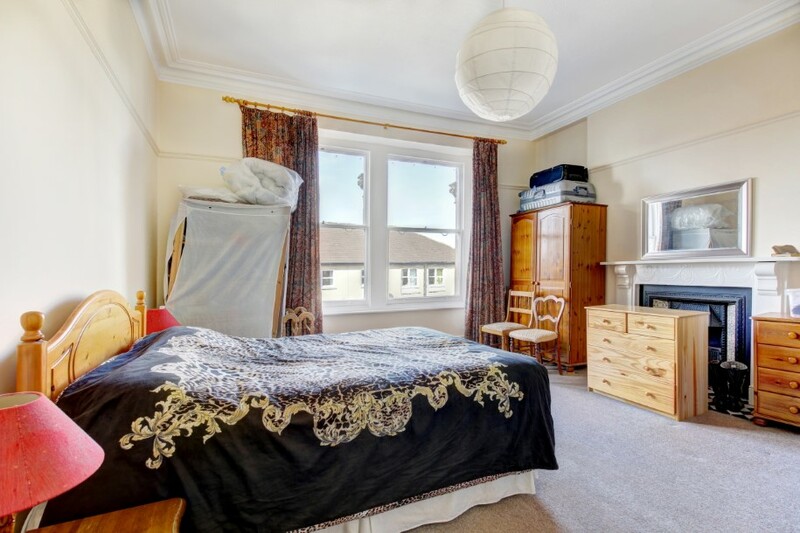 picture rail, wide bay with triple sash windows, laminate strip flooring in light oak finish, extensive range of twin built in double wardrobes with cupboards over, radiator. white suite in tiled surrounds comprising low level wc, wash hand basin with mixer tap built into cabinet surrounds with cupboards under & adjacent shaver points and mirror over, fully tiled shower enclosure with system fed shower unit, extractor fan, laminate flooring in light oak finish, heated towel rail/radiator, obscure glazed sash window. picture rail, wide bay with triple sash windows, radiator, boarded period fireplace surround & overmantel. 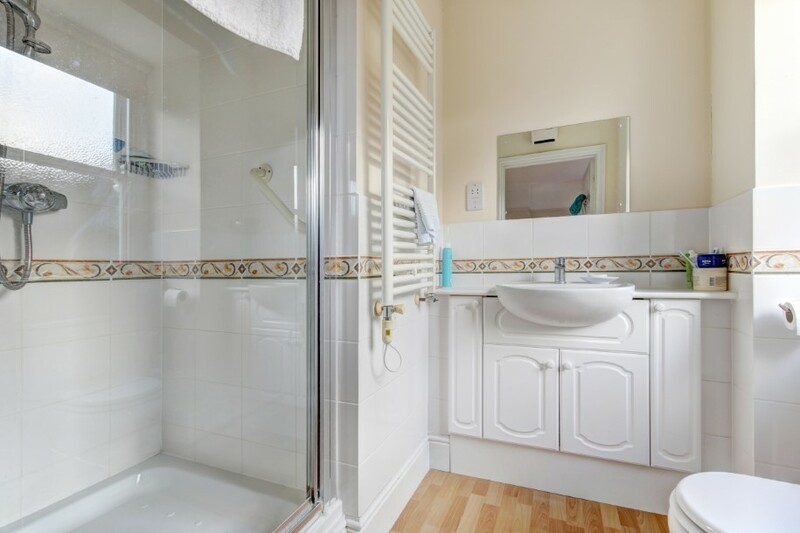 white suite in tiled surrounds, wash hand basin in cabinet with mixer taps, shaver points/mirror above & cupboard below, low level wc, panelled bath in recess with system fed shower over bath, extractor fan, electric heated towel rail/radiator, laminate strip flooring in light oak finish. 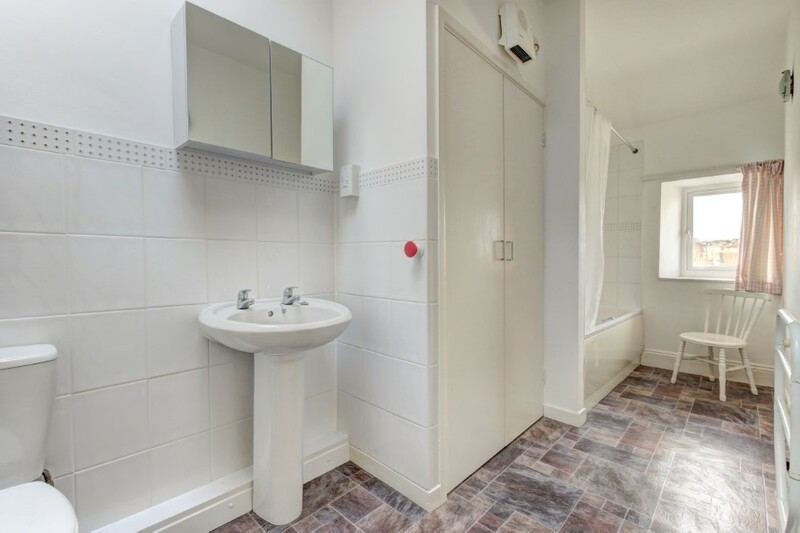 door out to rear garden, stainless steel sink unit and adjacent worktop with plumbing under for washing machine, boiler/linen cupboard with Worcester gas boiler, storage cupboard understairs, radiator. electric night storage heater, part ceiling cornice, electric trip switches, cupboard with plumbing for washing machine, entry phone. 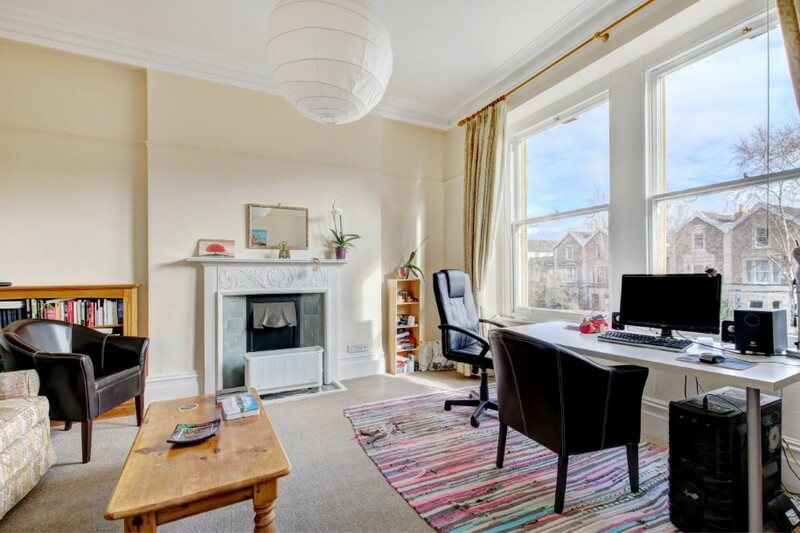 twin sash windows, ceiling cornice, picture rail, handsome period fireplace with surround/overmantel & iron/tiled insert and fire basket, electric night storage heater. ceiling cornice, picture rail, twin sash windows set in shallow bays, range of kitchen base & wall units incorporating drawers/cupboards & worksurfaces with tiling behind & inset stainless steel single drainer sink unit with mixer tap, further floor mounted storage cupboards, electric cooker connection, ample space for table and chairs, vinyl flooring. 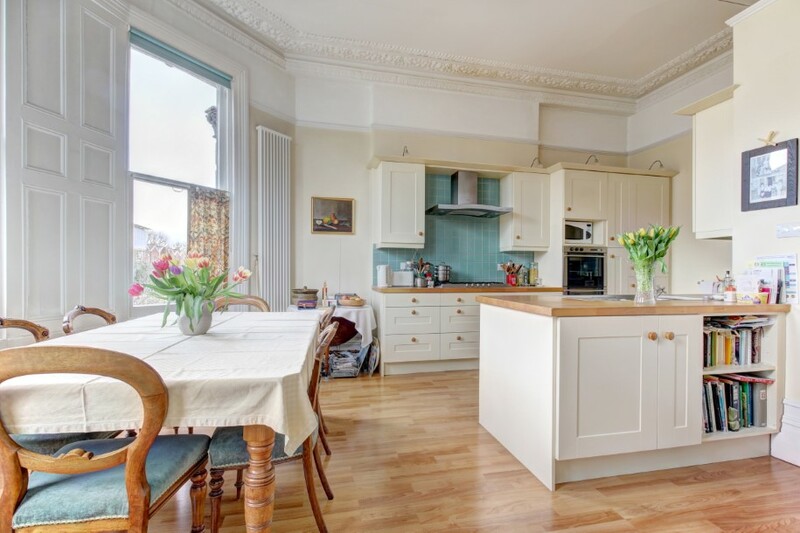 ceiling cornice, picture rail, twin sash windows into a wide shallow bay, fine period fireplace with surround/overmantel & iron/tiled insert & fire basket, electric night storage heater. sash window, white suite in tiled surrounds, low level wc, pedestal wash hand basin with adjacent mirror fronted cabinet, panelled bath with mixer tap and Triton electric shower unit over bath, electric heated towel rail, vinyl flooring, shaver point, Airing Cupboard with linen shelf and lagged hot water cylinder fitted with an electric immersion heater, extractor fan. communal staircase rising from first floor communal landing via a half landing with big sash window casting natural light into the stairwell and landings. but measured in two parts as (6'10 x 5'10 and 4'0 x 3'4) (2.08m x 1.78m and 1.22m x 1.02m) electric night storage heater, entry phone receiver, electric trip switches. 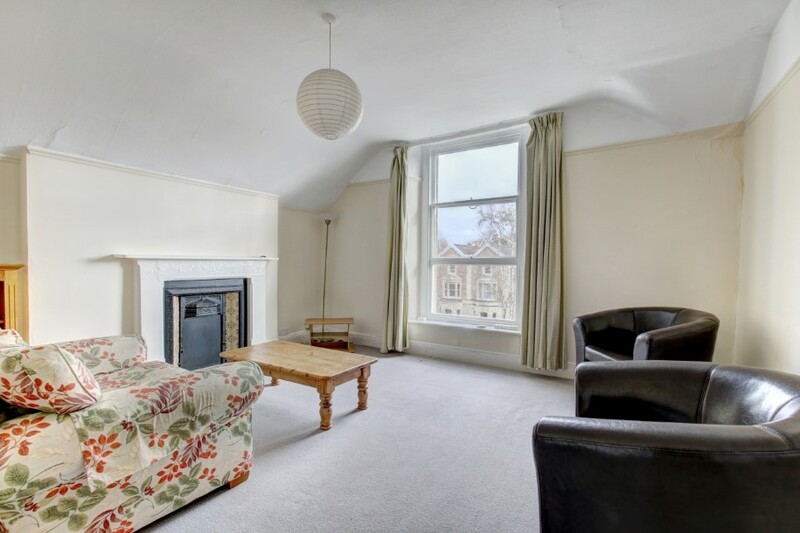 sash window with safety feature & roof top vistas, fine period fireplace with surround/overmantel, picture rail, electric night storage heater. 'L shaped max dimensions; sash window with rooftop vistas, picture rail, range of kitchen wall cupboards & base units with drawers/cupboards & work surfaces with tiling behind & plumbing under for washing machine, electric cooker connection, inset stainless steel single drainer sink unit with mixer tap, electric night storage heater, ample space for table and chairs, vinyl flooring. sash window with rooftop vistas, picture rail, period fireplace with surround/overmantel & iron/tiled insert & fire basket, electric night storage heater. small upvc double glazed casement window with rooftop vistas, ceiling skylight window (provides access to external roof areas), white suite in tiled surrounds, low level wc, pedestal wash hand basin with adjacent shaver points and mirror fronted cabinet, panelled bath with mixer tap and Triton electric shower unit over bath, electric heated towel rail, vinyl flooring, Airing Cupboard with linen shelves and lagged hot water cylinder fitted with an electric immersion heater, extractor fan. space for 2 or 3 cars (depending on size) on the paved & gravelled driveway/parking area within the front garden. stone boundary walls on 2 sides, rendered wall to other side, front privet hedge for privacy, gravelled area & paved patio with privet hedge and side borders, outside power points, rockery borders either side of pathway to main front entrance door, further side path on the left hand side leads down to the lower ground floor secondary front door where there is an outside tap, gas meter and store under the pathway area. borders containing flowering plants, shrubs and bushes, stone boundary walls, concreted rear terrace immediately behind the house, circular paved patio and gravelled area beyond, useful garden store/shed, external electric power points.